Generally, we recommend seeking a diamond with a Clarity grade of VS1 to SI2. 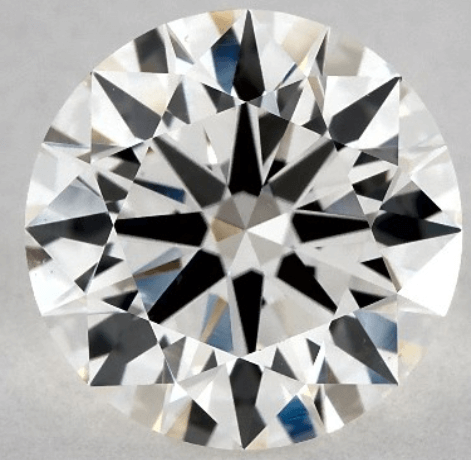 With a beautiful VS1 or VS2 diamond, your stone will look identical to a Flawless Clarity diamond assuming all else is equal (yet will cost far far less). As you increase your carat weight, and inevitably the size of your diamond, more blemishes and inclusions may be visible to the naked eye. For diamonds greater than 2.01 Carat, we recommend looking for diamonds within the the VS1 Clarity grade. Most importantly, review all potential diamonds closely to ensure that they’re eye clean. For assistance in reviewing diamonds for Clarity and other important features, contact our experts. To understand what VS1 is, it’s important to know what Clarity is (one of the 4 C’s of diamonds). A diamond’s Clarity refers to the visual appearance of blemishes and inclusions. By definition, VS1 diamonds are those that are Very Slightly Included. These inclusions, however, are rarely noticeable to the naked eye. In fact, diamond imperfections are almost inevitable. Diamonds are formed in the earth’s mantle at a depth of 80-120 miles. They face extreme heat of up to 2,200 degrees Fahrenheit. While their growth takes between one to three billion years, only the rarest diamonds emerge in perfect condition. Most often, diamonds are imperfect and contain varying amounts of internal inclusions and surface blemishes. VS1 Diamond inclusions are barely visible under 10x magnification (a standard jeweler’s loupe). When looking for VS1 inclusions using a loupe, it can take several seconds until the blemish spot is located. This also means that inclusions at the VS1 level are hardly ever noticeable to the naked eye, especially in diamonds that are less than 2.0 Carat. The most common mistake people make when buying diamonds is that they purchase a diamond with a Clarity grade that’s simply too high to appreciate. An eye-clean VS1 diamond will look identical to a Flawless graded diamond assuming all else is equal, but will cost significantly less. For example, this Round Cut 0.8 Carat Diamond is graded at a VS1 clarity with F Color and costs $3,280. This Round Cut 0.8 Carat Diamond is graded with a VVS2 clarity and F Color but costs $3,840. The VVS2 Diamond costs 17% more than the VS1 Diamond. Both diamonds are eye-clean—meaning you can’t see any blemishes or inclusions. Purchasing the VS1 clarity will get you the same result as far as beauty, but again, will cost 17% less. Each of these diamonds appears eye-clean at normal magnification. Any of these stones would make for a remarkable diamond ring. As you increase in Carat weight, and inevitably the size of the diamond, there’s a possibility that inclusions will be more visible to the naked eye. Some larger diamonds—even those with a high clarity grade like VS1 and VS2—may not be eye-clean. For example, this 3.02 Diamond with a VS1 Clarity, has a dark inclusion near the center of the diamond’s table. And this VS2 diamond at 4.05 Carat has noticeable surface blemishes. In these larger carat weights, you may want to include VVS2 diamonds in your search as well. This beautiful VVS2, for example, is a 3.01 carat diamond with no noticeable inclusions or blemishes. With 1 Carat diamonds, you can feel secure with a VS1 or VS2 grade. As you increase in Carat, be sure the diamond is clean of imperfections when you look at it with your naked eye. Without using any magnification aids, you shouldn’t be able to see any flaws or inclusions. 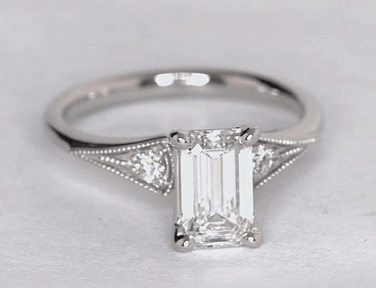 Asscher Cuts and Emerald Cuts are Diamond Shapes that contain step cuts. Diamonds with step cuts are either rectangular or square, and have many parallel facets. 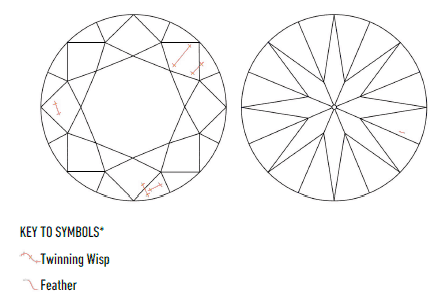 It’s important to know that step-cut diamond shapes show inclusions the clearest. For Asschers, Emeralds and Baguette shapes, it’s best to look at every diamond using high-quality 360° photographs (like with James Allen). You may have to bump up to a VVS2 to get an eye-clean diamond with step cuts. As you can see in the images above, an eye-clean diamond isn’t always guaranteed with the VS1 Clarity grade. Having an eye-clean diamond is largely dependent on a few factors: color of the inclusions, Cut quality (better light performance helps conceal imperfections), as well as the nature of the flaws. Here’s another questionable example of a 1.01 Carat Princess Cut graded with Very Slightly Included clarity. This inclusion may be visible to your naked eye depending on the type of lighting conditions and your eye’s orientation to the diamond. Overall, just be sure to review any diamond closely (no matter the Clarity grade) to ensure there are no noticeable blemishes and inclusions. If you’d like assistance in reviewing diamonds, please contact our Clarity experts. It’s often difficult to tell the difference between VS1 and VS2 diamonds, especially in weights of 1.0 – 2.0 Carats. For instance, look at this VS1 Diamond and then look at this VS2 Diamond. Can you tell the difference in their Clarity? Probably not, because even an expert would have a difficult time telling their grades apart without magnification. In order to truly notice the difference, you’d need a 10x magnification tool and probably diamond training. By definition, VS1 is a Clarity rating where minor inclusions are somewhat easily detected by a trained professional under 10X magnification. Without using any magnification aids, you shouldn’t be able to see any flaws or inclusions with your naked eye. VS2 clarity inclusions, on the other hand, are almost always easily noticeable at 10x magnification (a standard jeweler’s loupe). Occasionally, the inclusion will be in a difficult-to-spot location. In most cases, though, the inclusion is large enough that it can be spotted quickly under magnification. While VS2 diamonds are usually eye-clean, some outliers exist, especially when it comes to larger-sized diamonds. These outliers usually barely made it past the SI1 grade and have inclusions visible to the naked eye. This is why we stress the importance of reviewing magnified photographs and videos before any purchase. When it comes to Clarity, you want to take a close look at the diamond before making a decision. You need to see if the diamond has any inclusions and blemishes at the naked eye level. In order to look for these imperfections, you need high-tech images. That’s why recommend vendors who offer high-quality photography online. The only vendors that currently offer sufficiently high-quality images for reviewing Clarity are James Allen and Blue Nile. With their technology, you’re able to find diamonds like this beautiful SI2 from Blue Nile that saves you almost 25% over a mediocre VS2 like this from James Allen or one like this from Blue Nile. If you’re feeling unsure on Diamond Clarity, feel free to contact us. After helping thousands of readers, we have plenty of experience sifting through images and figuring out which diamond is eye-clean.